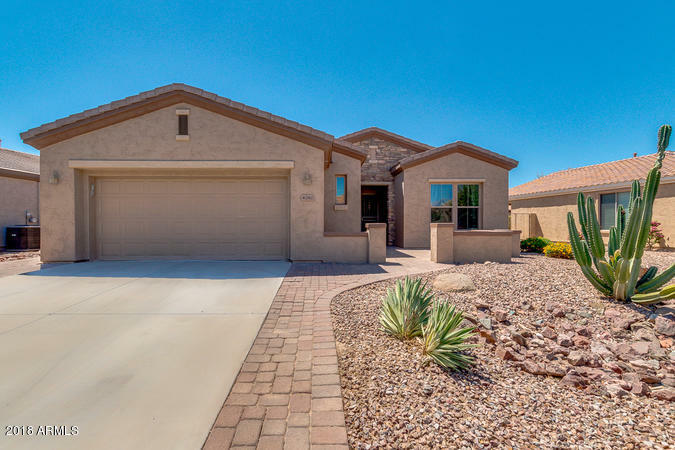 Come see this immaculate, well cared for home located in the much sought after South Gilbert Adult community of Trilogy at Power Ranch. This two bedroom plus den home is move in ready with new bedroom carpet, easy to maintain tile floors throughout the rest of the home, freshly painted interior, new 14-seer air conditioner, epoxy garage floors with insulated garage door along with built in cabinets and workbench, and beautiful paver front courtyard and backyard patio enhanced with a lovely fountain. The kitchen boasts ample storage and a huge island along with a separate eating area. The master bath has raised vanities and a stunning tiled shower. The home also has a Reverse Osmosis and Water softener system that are owned. Not only will you have a fantastic home, but the community amenities are outstanding. Trilogy offers a Golf course, Clubhouse with a restaurant & cafe, Bocce ball, Pickle ball, Tennis courts. Library, Card Room, heated pools, spas, a newly remodeled fitness center, and activities to suit any interest. Welcome home.